Drama. Analysts and investors often confuse a company and its “stock price” and they end-up taking “short cuts” in which something allegedly “good” or “bad” (sic) in a company’s alleged prospects is projected onto its “stock price”. Although that might seem like “rational behaviour” – and what else are they to do – the behaviour and its inference are akin to “racial profiling” and the consequences are similar. Such as confusion, missed opportunities and irrelevance (The Street, January 6, 2014, PetSmart Slumps as Deutsche Bank Slaps With ‘Sell’). 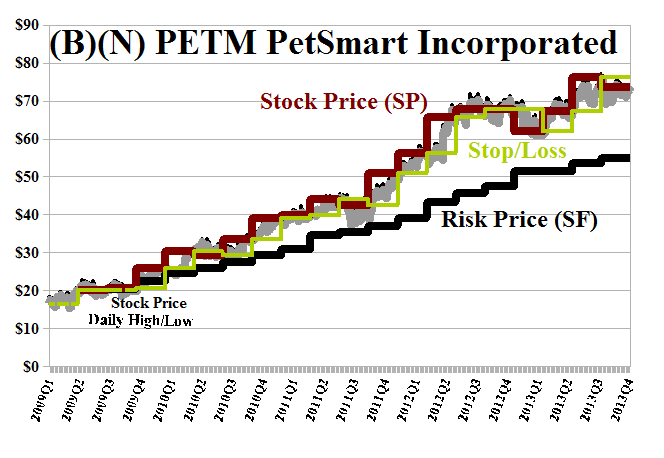 It’s evident from the chart below (please see Exhibit 1) that PetSmart has been providing us with not only great products for our pets but also a great product for our portfolio. And that’s the point. The stock price is not about how much the company earns but how much can we earn as investors who own some of its stock – is our money “safe” – 100% capital safety – and are we likely to obtain a hopeful return above the rate of inflation. That is, might someone possibly offer us a higher price for the stock that we own, sometime in the future? Possibly based on the Deutsche Bank report, the stock price slumped $2 today to $69 but what does that mean for the long term. That’s right. Nothing. And it doesn’t affect whether we should own it or not. Maybe we should buy it? The company has been in our portfolio since $20 three years ago and currently pays its shareholders $81 million per year in dividends for a current yield of 1.1%. Our estimate of the downside in the stock price due to the demonstrated volatility is minus ($4) per share so that we would not be surprised by any price between the current $70 and $66 to $74 in the next quarter. We also note that the current “price of risk” is $55 and rising (Risk Price (SF) in Exhibit 1 below) which means that the stock is “undervalued” at $70 and that we will tend to buy and hold it at any price above $55 absent being forced to take profits. Now, isn’t that interesting! PetSmart Incorporated provides specialty products, services and solutions for the lifetime needs of pets in North America. It offers products for all the life stages of pets, professional grooming, training, day camp for dogs and boarding. From the Company: PetSmart Incorporated together with its subsidiaries, operates as a specialty retailer of products, services, and solutions for pets in the United States, Puerto Rico, and Canada. The company offers consumables, such as pet food, treats, and litter; and hardgoods, which include pet supplies and other goods comprising collars, leashes, health care supplies, grooming and beauty aids, toys, apparel, and pet beds and carriers, as well as aquariums and habitats, accessories, décor, and filters for fish, birds, reptiles, and small pets. It also provides fresh-water fish, small birds, reptiles, and small pets; and pet services, such as grooming, including precision cuts, baths, nail trimming and grinding, and teeth brushing, as well as training, boarding, and day camp services. In addition, the company operates PetSmart PetsHotels that offer boarding for dogs and cats; provides personalized pet care, temperature controlled rooms and suites, daily specialty treats and play time, and day camp services for dogs; and operates veterinary hospitals, which offer services comprising routine examinations and vaccinations, dental care, a pharmacy, and surgical procedures. As of March, 27, 2013, it operated 1,278 pet stores; and approximately 196 in-store PetSmart PetsHotel dog and cat boarding facilities. The company also offers its products through an e-commerce and community site, PetSmart.com. PetSmart, Inc. was founded in 1986, has 24,000 employees and is based in Phoenix, Arizona.